Released: 9th June 2011 (UK) / Jan 2012 (USA). Official synopsis: "A bloody war is raging across the oceans, with the Pirate Federation and Nocturnals in alliance against the renegade Vampirates, led by Sidorio and Lola. Lola might be heavily pregnant with twins, but it doesn't stop her from remaining an active in battle! Connor and Grace Tempest each have important roles to play - he as a pirate warrior at the heart of the fight; she as a powerful healer working with the war-wounded. 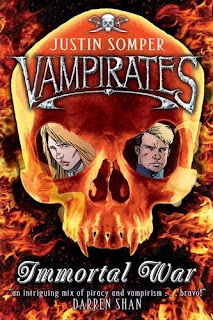 As the twins face their greatest challenges to date, old allies and foes return to play their part in the ultimate battle of Pirate versus Vampirate." On 6th June 2005, Simon & Schuster published, Demons of the Ocean, the first book in a sequence of books to set the barren landscapes of adolescent male reading alight. In a world of spies and wizards it was a refreshing read. And in the 6 years that have passed, we've seen blood, death, oceans, vampires and pirates aplenty. And now they are set to publish this, the sixth and final book of the sequence, Immortal War. Conceived by Justin donkeys years ago (he actually had the idea 5 years before Demons of the Ocean was published, so the end has been 11 years coming - wow!) the series blended the world of vampire and pirate together. I have to admit to being a little nervous, okay... very nervous to read this book. I've been a fan of the series pretty much since I got the first book after seeing Justin talking about it on Blue Peter way back in the Summer of 2005. I speak to Justin quite a bit and have done since about 2006! Email, twitter, you name it. Every time there's a piece of news my excitement burns a little brighter and so my excitement in the weeks leading up to this one has been exceptionally mental. Every book, Justin topped himself and brought out something bigger, more epic than the last. And then I got my copy from the lovely people at S&S! Cue major excitement, shouting and maybe a little bit of crying at the fact it was finally here... As I sat down I was in two minds. The first was that as long as it was as good as Blood Captain (my then favourite in the series) I would be very happy. The other was to try and not to expect anything - to just sit back and let Justin take me across the ocean into the heart of the war between Pirates and Vampirates. And wow... I was not disappointed. The book opens with a prologue that takes us way back and begins to fill in some gaps and sets the tone well for the book. We're then taken back to the present (or future considering the books are set 500 years into the future...) and right into the midst of the war. Grace is at Sanctuary doing her best to help the war wounded, while Connor is right in the very heart of the war as a key member of the Alliance that has formed between the pirates and Nocturnals - vampires who shun the blood-thirsty ways of renegade and self styled Vampirate King Sidorio and his monstrous - although fascinating... - wife, Lady Lola Sidorio Lockwood, who just happens to be heavily pregnant. With a prophecy that looks set to send shock-waves out through the characters, and more tension and action than you can shake a stick at, Immortal War makes for a brilliant read. I would say, read the first 5 first because the true magic of this book is that as a reader, you really do become close to the characters. You've seen them grow, and change into the people, or demons..., they are now and really fear for their lives as they fight for supremacy over the oceans. I have to say that Connor in particular in this book was a personal favourite. The secret that he is a dhampir, as is Grace, is eating away at him and he can't stand it. He's trying to fight himself, yet at the same time finds it hard not to cave in to his blood hunger. Along with a few new tricks he learns in the book, it's the strongest he's ever been as a character and he was a personal highlight in this book, or more his experiences were. Most of all, I'm glad at the overall outcome. The ending is just - wow... I don't want to say anymore incase I spoil anything, so I'll just say you need to check it out! Justin has done the characters, the story and his Nocturnals - that's what his fans are called... ;) - worldwide justice. I can't begin to thank him enough and pity his poor inbox right now! Haha! Seriously, you need to check out this series. It's addictive regardless of your age or gender. I defy any boy who doesn't like reading not to be engrossed and captured by this series. A fitting end to the series. Enough said really. Can't wait to see what Justin does next!